I’m teaching a pressure cooking class in a few weeks and we are doing a brunch theme on a Saturday morning. Life doesn’t get much better, does it? I am now facing the challenge of fine tuning my recipes and having them ready to share with the class. So here we are, talking about French toast in the pressure cooker. 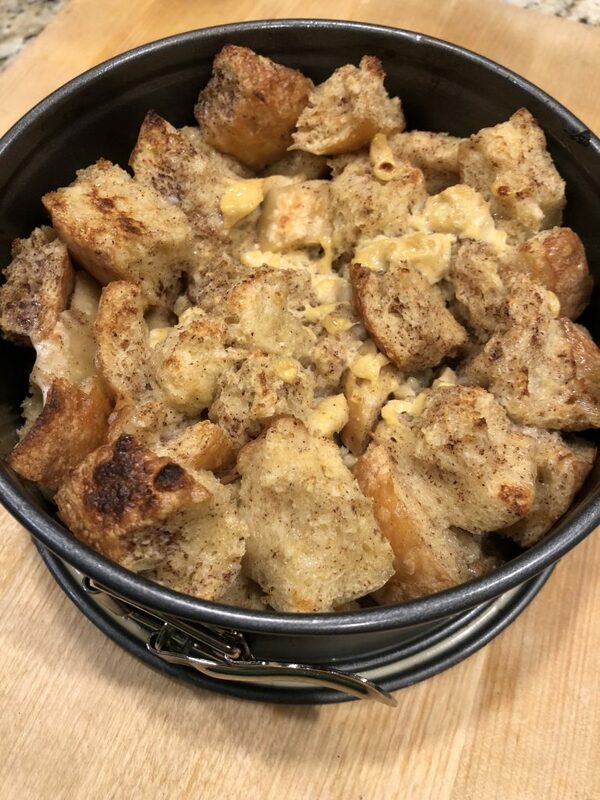 This French toast is a cross with bread pudding, since in order to make it work in the pressure cooker, you will cube your bread instead of leaving it in slices. The quantity of this recipe leaves me wanting, it serves four nicely. If you have a larger group to serve, you may need to plan to make two or use a larger pressure cooker that can fit a larger cake pan – your cooking time should not change. I will note that it cooked pretty quickly, very little warm up time, and the 5-minute quick release is helpful, also. So, if you cook two in a row, I can see it working out okay for serving them together. Use brioche or a lighter, sweet bread. 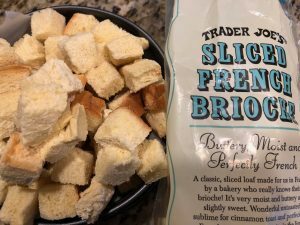 I found a nice loaf of fluffy, slightly crusty French bread at Costco and it worked well. This is not the time to break out the multigrain, sourdough breads. They will just end up being so heavy and dense that you won’t be happy with the end results. Since I bought my bread at Costco, I had a lot of it. I sliced it all up and then froze it cubed. It is ready to go when I want to make the next batch of French toast. Alternatively, it can be made into croutons sometime down the line. 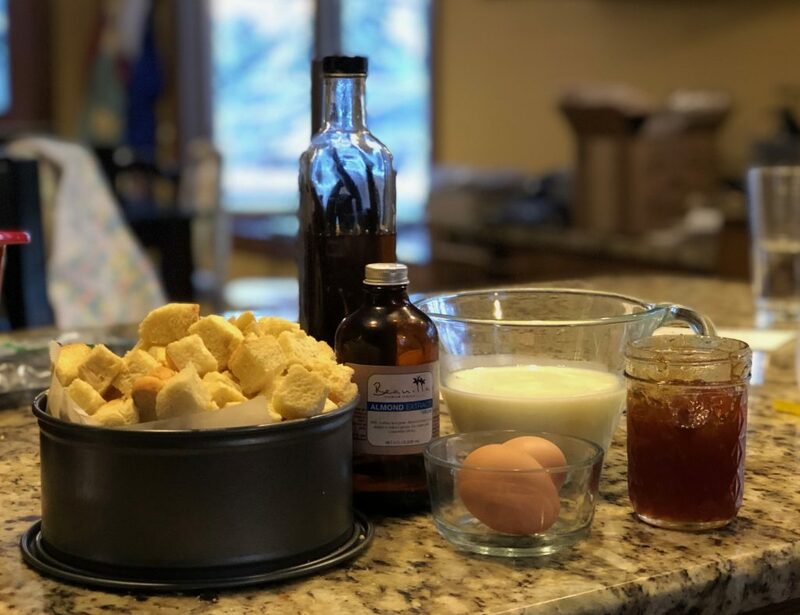 There is no long soak needed of the bread in the egg and milk mixture, like you would with traditional French toast or bread pudding. The pressure cooker magically does the work of getting the liquid into the bread. My little cheesecake pan that fits the Instant Pot manages to leak. I put tin foil around the outside, but it only helped to collect the liquid that escaped the pan. Next time, I plan to line the inside of the pan with a bit of parchment paper to keep that eggy goodness where it belongs. Speaking of cheesecake pans, if you don’t have one for your pressure cooker, don’t stress. Find a Pyrex or other oven safe pan that fits and go for it. Some people find they need a few extra minutes when they use a Pyrex, but I have never found that to be the case. When I pulled my French toast out of the InstantPot, the top looked like it needed a little crisping, so I poured a little melted butter over the top and toasted it under the broiler in the oven. This is an optional extra step. Totally optional, but worth it, if you have the time. You can add a little cinnamon and sugar to the top also, but be sure to watch it carefully under the broiler. You can also add fruit to the French toast while it cooks. I’m planning to try adding frozen blueberries in my next batch. Of course, fruit as a final topping is an excellent option, also. With no further ado, here is the recipe. I hope you enjoy! This is a quick, delicious breakfast for when you need something a little sweet and special without a lot of work! Think of it as a breakfast bread pudding. Pour bread cubes into the cake pan that you'll be using for this recipe. Fill the pan slightly over the top - the bread will shrink slightly during cooking. I use a 7-inch cheesecake pan, but a Pyrex bowl works also. Prepare your pressure cooker by adding 1 cup of water and placing a steamer rack in the insert. Prepare a tin foil sling for your cake pan, if you can't easily remove the pan from the pressure cooker. To prepare a foil sling, roll two long pieces of tin foil into 1 inch wide strips, cross the strips in an x on the bottom of the cake pan to lift it easily. Combine milk, eggs, brown sugar, vanilla, cinnamon, and any optional ingredients into a large bowl. Toss bread cubes with the milk and egg mixture. Oil or butter the cake pan. Line the cake pan if you think it will leak or wrap it in tin foil. Pour the bread and egg mixture into the oiled cake pan. Cover the top of the cake pan with tin foil or a couple paper towels to keep the top of the French toast dry. Cook on high pressure for 15 minutes. Turn off the keep warm setting. Once the cooking time is complete, allow to rest 5 minutes before manually releasing the remaining pressure. If you'd like a crispier top, drizzle the melted butter over the top and put under the broiler for 3-4 minutes until you see it bubbling. Serve with syrup, fruit, whipped cream, or powdered sugar and enjoy! My mom has a great baked bean recipe for the crock pot. It takes anywhere from 3- 6 hours to cook in the crock pot and uses canned beans. I have tried and tried to convert her recipe to use soaked, dried beans in the crock pot, but I’ve finally decided I don’t have the patience for them to cook that long. Plus the sauce never got thick enough with the soaked beans. Enter the pressure cooker. After trying several different baked bean recipes for the pressure cooker, I finally found one that came close to what I wanted. A little tweaking and used the seasoning in my mom’s recipe, and I think we have a winner! This is an update of my moms crock baked beans. Plan ahead and soak your beans the night before. Soak extra and freeze them and save time the next time you make this recipe. 2 cups of dried beans - navy is traditional, but I use a combination of pinto, black, butter and kidney. The night before or morning of, rinse and soak beans in clean water. Cover by at least three inches of water. After 8-12 hours, drain. You should have about 4 cups of soaked beans, or about 2 pounds. Heat pressure cooker to sauté and brown bacon. When bacon is almost done, add onion and sauté another 3 or 4 minutes until onion is translucent. Add drained beans, 2½ cup of water, brown sugar, molasses, catsup, mustard and salt. Stir. Lock lid on pressure cooker and cook at high pressure for 35 minutes. When timer beeps, turn pressure cooker off and wait 10 minutes. After 10 minutes use a quick pressure release to release any remaining pressure. Discard any beans that are floating. Check several beans to see if they're tender. If not, pressure cook 5 minutes longer and check again. Leave lid off. Turn pressure cooker to simmer and simmer beans uncovered, stirring occasionally so the bottom doesn't burn, until the sauce is the desired consistency. * If you don't have time for an overnight soak, use the browning setting to bring 6 cups of water to a boil. Boil beans for two minutes. Turn pressure cooker off and let beans soak one hour. Proceed with the recipe as directed. There’s nothing like a pile of waffles early in the morning. And it’s even better when most of the work is done the night before. 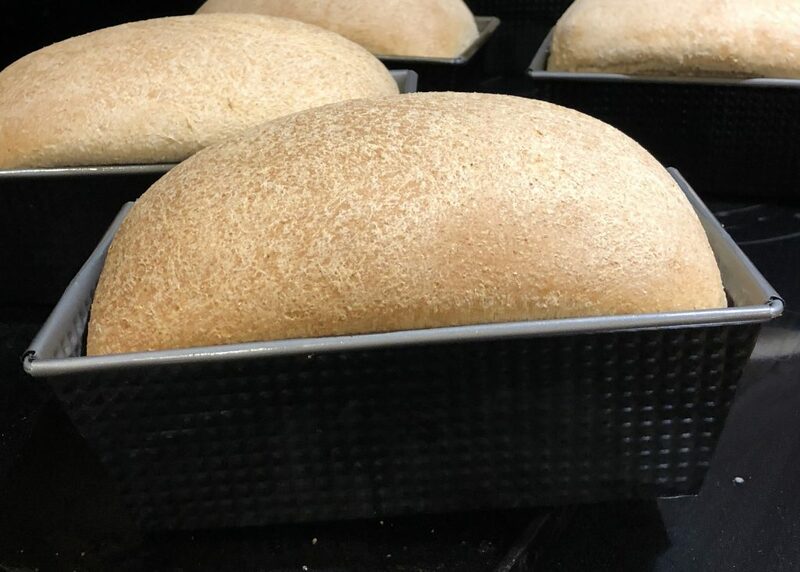 This is a recipe that I usually teach in my Sourdough Baking Class – it is super easy and is also a great way to use up the unfed starter instead of discarding it. Also – if you forget to make the overnight sponge the night before, don’t sweat it. 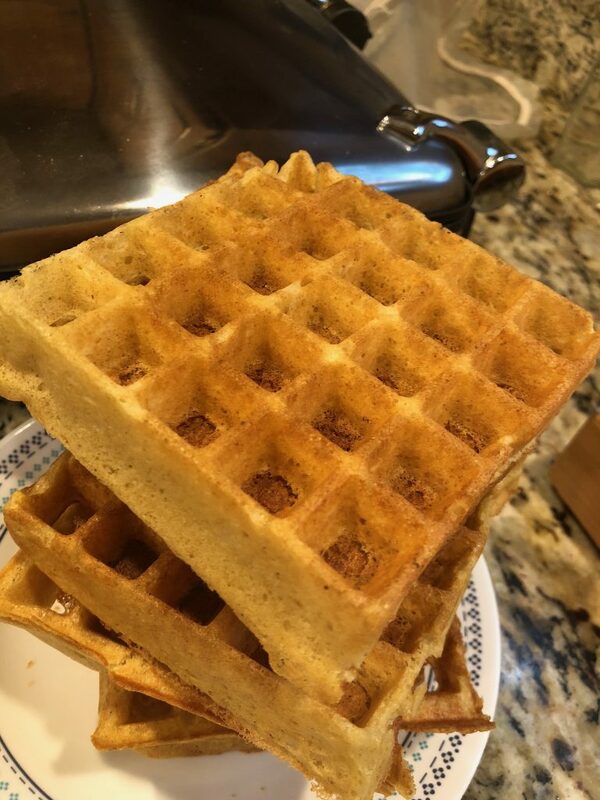 I’ve done the overnight sponge a couple hours before finishing the batter and still had great waffles. And while I’m technically one of those people who believe that pancakes and waffles deserve separate recipes, this recipe can bridge that gap in a pinch. You know… for those mornings when you want waffles but the kids are screaming for pancakes. This is a make ahead recipe - spend 5 minutes the night before and make your morning a little easier. Half the recipe if you want fewer waffles, or freeze the extra to cover breakfast for the rest of the week. Day 1 - combine all ingredients of overnight sponge (flour through sourdough starter) in a large bowl. Cover with plastic and let rest at room temperature (or 8-12 hours). Yes, the milk overnight will be fine. Day 2 - Combine the overnight sponge with remaining ingredients. Stir just until combined. Cook as pancakes on a hot griddle or use batter to make waffles in a hot waffle iron. This dish may sound strange to the non-Germans out there. Give it a chance – it may surprise you. I like to make this dish with red cabbage, but if you have a green cabbage handy, just use it. You can also mix up the cumin and swap it out with fennel or caraway seeds. 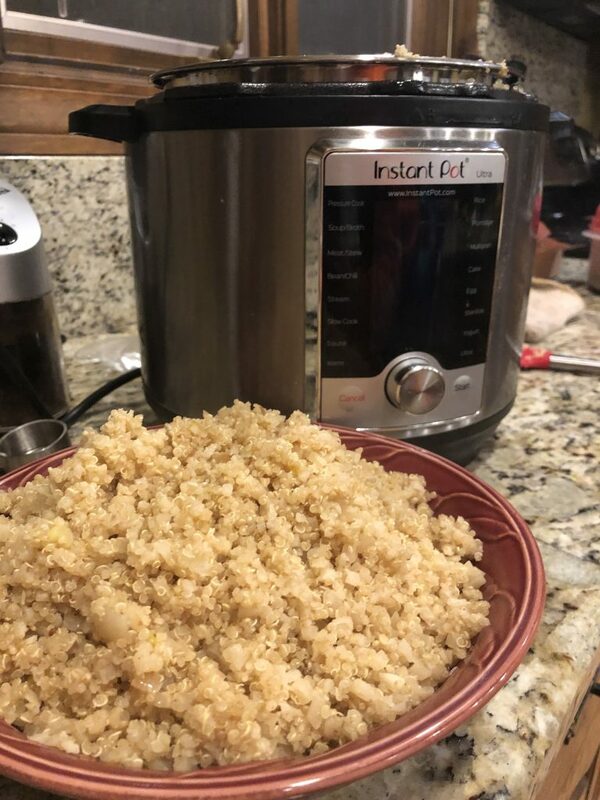 Finally, just to throw in a little pressure cooker love – if you were to make this without the pressure cooker, you’ll be cooking it for about an hour. Here it cooks for 3 minutes under pressure. Can’t beat that. This cabbage dish is a great side to roasted meats. Use red cabbage for a colorful addition to your plate. Heat the pressure cooker base on medium heat, add the oil, and heat briefly. Stir in the onion and cumin and saute until the onion has softened (about 3 minutes). Add the cabbage and stir to distribute the onions. Sprinkle with the sugar and salt and then pour the vinegar and waterover the top. Close and lock the lid of the pressure cooker. Cook at high pressure for 3 minutes. If using an electric pressure cooker, turn the "keep warm" setting off. When the time is up, open the cooker using the Normal Release method. Give the cabbage a final stir, transfer to a serving dish, and serve immediately.